Young and the Restless (YR) Spoilers: Will Victor’s Return Bring End To J.T. Storyline? Victor’s (Eric Braeden) been gone for awhile on ‘The Young and the Restless’. But not nearly as long as the J.T. (Thad Luckinbill) storyline has been told. 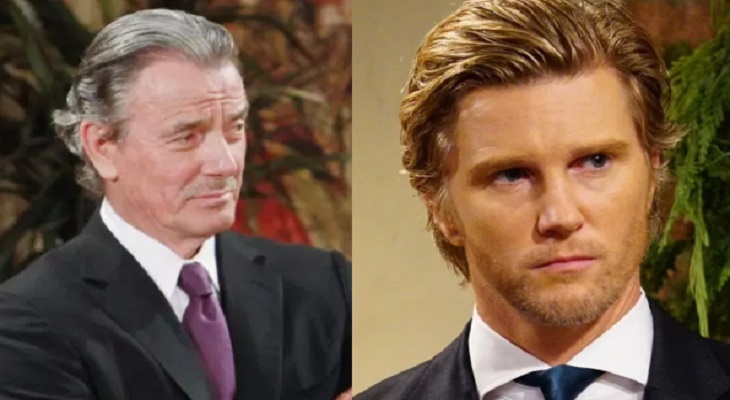 Crossing the eight-month mark since Luckinbill’s character was horrifically written off the show, via Nikki’s (Melody Thomas Scott) third kill, and subsequent ‘Fearsome Foursome’ coverup, viewers are wondering if the ‘Moustache’s’ return to Genoa City means that this stretched arc is ending? Sure, Victor won’t fly back into town, and solve everyone’s problems within one episode. But possibly Braeden’s return to the cast after his few-month absence indicates that a Christmas-time wrap is starting. Viewers assume that Victor will surely learn about Nikki’s accidental act at some point after she recovers from being hit by the car unlicensed Reed (Tristan Lake Leabu) was driving. The ‘Black Knight’ was also need to fend off his grandson, who just learned that Victor is suspected of murdering his father. Ah, what a nice family Christian Miller created after he rebranded himself a new man all those years ago. Once Y&R allows Victor to know the full story of what Nikki and his daughter, Victoria (Amelia Heinle), have been going through, Braeden’s character will pounce. Victor is simply not going to allow Rey (Jordi Vilasuso) to verbally harass his loved ones without fighting back. Whether Detective Rosales has enough hard evidence to haul Victor in for more than questioning is a different issue. Clearly, whoever was gaslighting Nikki with J.T.’s clothes likely also burned down the Ranch stables and planted the gun. That person’s identity must be revealed and Victor’s private security force stands as the best possible source to fish out this villain. Victor’s return, at this point in the J.T. storyline, will serve to break Rey’s investigation open. Spill-outs could include a definitive answer as to J.T.’ impossible, yet still somehow possible existence, an unmasking of whoever, or however many people are targeting the coverup crew, and closure for Mr. Hellstrom’s loved ones. Fans of ‘The Young and the Restless’ rightfully express their opinions on a regular basis. So, will Victor’s return bring end to the J.T. storyline? Days Of Our Lives Spoilers: Salem Police Closing In On Gabi – Headed Back To Prison After Julie Drama?